BMC Group provides an optimized claims processing solution through a centralized, interactive reconciliation platform to deliver to the debtor, and its professionals, access to all claims and the status of claims. BMC Group's innovative e-claims processing system provides a secure online workspace designed to meet the knowledge sharing demands of bankruptcy case management. Once a chapter 11 is filed, the United States trustee is required to supervise the administration of the case. 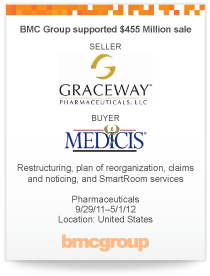 As a claims agent, BMC Group works with trustees to ensure all operating guidelines and reporting requirements are met. When the debtor is subject to any reporting requirements, BMC Group can assist the debtor in fulfilling this need.